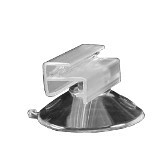 Suction cups are used to hang or support a variety of signs on glass or other smooth surfaces. They are particularly useful for signs that are changed often. Choose from a variety of ways to attach suction cups to your sign. With the suction cup mirror clip, small and medium-sized signs can be held parallel to smooth surfaces such as walls, windows, and cooler cases. Available in two sizes, the suction cup mirror clip features a finned sign grip for a secure hold on signs up to 0.070” thick. The suction cup flag clip holds small and medium-sized signs at a right-angle to smooth surfaces such as walls, windows, and cooler cases. Available in two sizes, the suction cup flag clip features a finned sign grip for a secure hold on signs up to 0.070” thick. The suction cup features a “friction ring” (a raised ring which encircles the suction cup’s stem). Lightweight signs and hooks can be held in place between the base of the suction cup and the friction ring. In addition, a 0.125” hole on the top of the stem accepts standard and nylon tacks. Sometimes called the "baby on board" suction cups, these suction cups holds small signs on glass. Signs can be hung directly from the cap by pushing the cap through a drilled hole on the sign; turning the sign at an angle allows the suction cup's cap to pass through the hole. In addition, a 0.125” hole on the top of the stem accepts standard and nylon tacks. 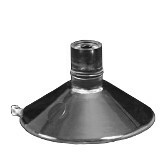 These suction cups are available in small, intermediate, medium, and large sizes. These suction cups have a mushroom head with an attached wire hook. The hook is affixed between the “mushroom head” cap and the stem and provides a hanging point for signs, banners, or light weight, non-fragile product. Available with medium or large size suction cups. These suction cups have a hole in the stem that accepts a clear tack. 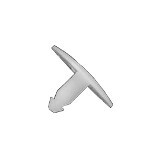 The tack pierces sign stock, or passes through drilled or punched holes. It then grips the corresponding hole in the suction cup’s stem holding signage in place. 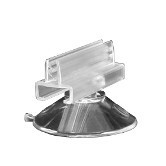 We also carry replacement clear tacks for these suction cups. 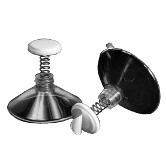 These suction cups are sold with a nylon secure tack. The tack pierces sign stock, or passes through drilled or punched holes, then grips the corresponding hole in the suction cup’s stem. The tack's barbed end creates an extra-secure grip in the suction cup’s stem hole. 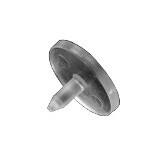 We also carry replacement nylon secure tacks. 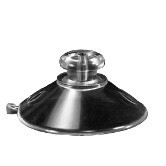 This medium-sized suction cup has a 1/8” stem hole (larger than our standard suction cups). This larger hole accommodates a 1/4” long binding screw. The screw passes through drilled or punched holes in sign, then grips the hole in the suction cup’s stem, holding your sign in place. Screws can be pushed into the suction cup with finger pressure. No tools are required. This medium-sized suction cup has a 1/8" stem hole. It is furnished with a 1/8-inch diameter x 1/2-inch long pan head screw. The screw fits the suction cup’s stem hole and is used to affix signs to the suction cup. 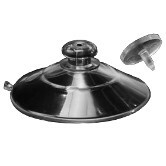 These medium-sized suction cups have a 9/16” extended stem and a 1/8" stem hole. They are designed to produce a “stand-off” effect and can be used with 1/8” diameter screws to affix signs to the suction cup. 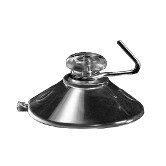 These medium-sized suction cups have a 1/4" hole in the stem that can accommodate a variety of inserts, such as dowels and split-tubes for holding small signs, and screws that can be used to affix a wide variety of signs and danglers. Note: Inserts are not included. The product photos are meant to show display options only. 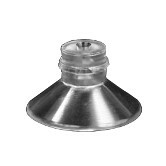 This tack will work in any of our suction cup that has a 0.116” hole in the stem. 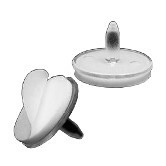 Choose your ideal suction cup size and adhere your signage to that cup with this clear tack. Note: Tacks are sold with many of our more popular suction cups. Thses tacks are intended as replacements for lost or damaged tacks as well a converting plain suction cups to use a tack. 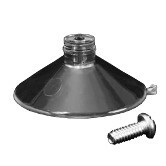 This tack will work in any of our suction cup that has a 0.116” hole in the stem. 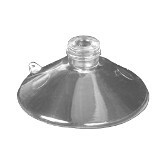 Choose your ideal suction cup size and adhere your signage to that cup with this nylon secure tack. 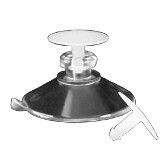 This tack, which is sold coupled with several styles of our suction cups, has been modified by the addition of a peel-and-stick adhesive button. 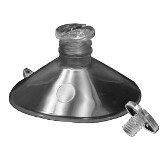 The tack will work in any of our suction cups that has a 0.116” hole in the stem. Insert the tack and remove the adhesive button’s liner to attach small and medium-sized signs. Note: Tacks are sold with many of our more popular suction cups. Thses tacks are intended as replacements for lost or damaged tacks as well as converting plain suction cups to use a tack.